Religious conversion has traditionally been understood as the abandonment of one religious identity for another, or a switch from no religious identification to a newly religious one. Psychologists, sociologists, anthropologists, and others have viewed conversion as a sudden, singular event in one’s life. In the 1960s and 1970s, in the wake of new religious movements and the flowering of Asian religious traditions in the West, sociologists reformulated conversion as an active, gradual process of transformation. Conversion, in these understandings, is not a changed subjective or ontological identity but rather a shift in one’s discursive universe, social relationships, and embodied practices, a new role learned through language, behavior, and interpersonal boundary maintenance. Similarly, deconversion and its scholarly synonyms (apostasy, alienation, disaffiliation, defection, exit, leaving) has many contexts, motivations, and processes, including loss of a specific religious experience, doubt or denial of beliefs, moral criticism, emotional suffering, and unlearning particular vocabularies and behaviors. 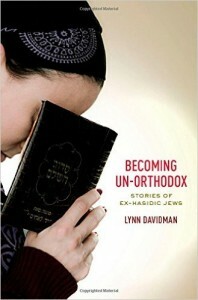 For this interview with Lynn Davidman, we focus on the concepts of conversion and deconversion*, illustrations of these processes in various contexts, what each term means and how each is experienced in someone’s life, the histories of these terms and their use in scholarship, and issues that arise from their conceptualization or use. You can download this interview, and subscribe to receive our weekly podcast, on iTunes. If you enjoyed it, please take a moment to rate us. And remember, you can use our Amazon.co.uk, Amazon.com, or Amazon.ca links to support us at no additional cost when buying academic texts, jelly beans, the artist formally known as “Prince” memorial T-shirts, and more. *Our interview took place during the Association for the Sociology of Religion annual meeting, held in Chicago. During our conversation, Davidman refers to comments made at an author-meets-critics panel about her new book which took place earlier that day. *For more on conversion, see L. Rambo, Understanding Religious Conversion (1993) and L. Rambo and C. Farhadian, The Oxford Handbook of Religious Conversion (2014), as well as D. Snow and R. Machalek, “The Sociology of Conversion” (1984). *For more on deconversion, see H. Streib et al, Deconversion (2009) and P. Zuckerman, Faith No More (2011).